PVWC's next adventure is scheduled for this Saturday, April 30th. 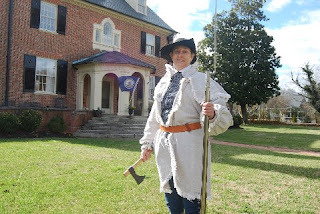 We'll do a cruise to Cul's Courthouse Grille in Charles City County, Virginia. for menu and other information. Please plan to meet at Patriot Square Shopping Center in Yorktown @ 10:00 am---we'll depart no later than 10:30 am to ensure our group arrives around 11:30 for lunch----given the popularity of this place, the earlier we get there for lunch, the better. BTW, the May meeting is this Sunday, May 1st @ 7 PM at the Jefferson Diner in Newport News. We'll continue with the monthly canned food drive. If you'd like to donate, please bring canned goods or other non-perishable food items to the meeting…we'll be collecting for the Virginia Peninsula Foodbank. Dear Larry & Sally , ... and the rest of the CCC Club, ( but only come if the Cruise-In is rained out. ). Elizabeth Thompson, a loyalist spy from South Carolina and Deborah Samson, a soldier from Massachusetts. Fellow VPCCC Delegates: Please see the attached --- This is a wonderful opportunity that historically has been supported almost entirely by Classic Cruiser Car Club Members. As stated "There will be music to enjoy, Christian fellowship, food, fun, and lots of cars, trucks, etc. (classic and new) on display". It doesn't get any better than that. Please distribute this to your memberships and encourage participation. Tax day. It's dreaded, it's feared, it's loathed. And rightfully so. Last year, Americans rushing to file their taxes by the April 15 deadline dealt with a 74,608-page-long Internal Revenue Code (tax code). And whether you're an early 20-something finishing school and paying taxes for the first time or you're a 50-something with diverse assets and your own business, that's daunting. Our impenetrable tax code makes it impossible to feel confident that you've filed your taxes correctly without an extraordinary amount of time, effort, and expense. Tax day shouldn't be a horror story. There's a better way. And the bottom line is this: our complex tax code stifles economic and jobs growth. I believe that comprehensive, fundamental tax reform is absolutely necessary for us to compete in global, national, and even local markets. We can't continue to expect the American people to shoulder the burden of a tax code that is ever-expanding to accommodate a bloated bureaucracy and special interests. That has to end now. Washington has been talking about reforming the tax code for years without any real action, but I believe that we can't address the significant inefficiencies our tax system creates without committing to comprehensive, fundamental reform. I want to see a simpler, fairer, more competitive tax code that supports the folks who are working hard, creating jobs, and expanding our economy. That's why I am a cosponsor of the Tax Code Termination Act (H.R. 27). Authored by House Judiciary Committee Chairman Bob Goodlatte (VA-6), this legislation sets a deadline for legislative action in the tax arena. It requires Congress to approve a new, streamlined federal tax system and abolish the Internal Revenue Code by the end of 2019. That's an absolute must. According to a national poll, more than 75 percent of voters in both parties don't believe the tax code is "generally fair and equitable." Congress has to do its job and address those concerns. Incremental reforms are an earnest way forward, but I believe we need more. We need to start anew with a user-friendly tax system that supports individual enterprise. It'll promote savings, it'll promote investment, and it'll promote economic growth in a way that eliminates fear and anxiety for the taxpayer. I'll continue to work hard to make sure that happens. Common Core News (@CommonCores) liked one of your Tweets! @YorkTeaParty: Follow Yorktown StateFarm, Voiceless The Movie and Halt Common Core on Twitter! Follow Yorktown StateFarm, Voiceless The Movie and Halt Common Core on Twitter! This email was generated for @TribbleTehFuzz.